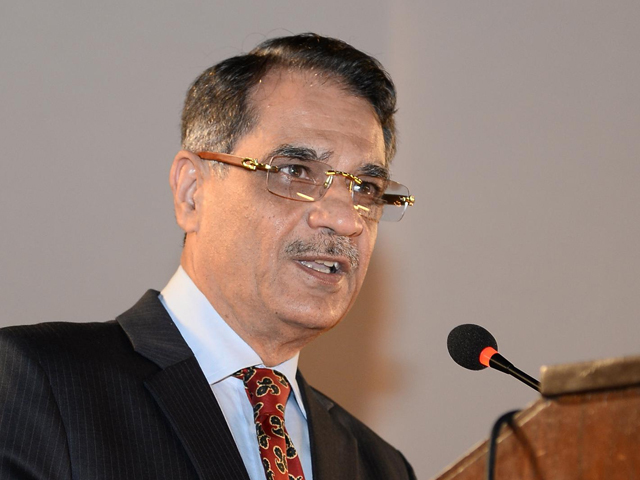 Chief Justice Saqib Nisar asked how the railway department, which is a part of the Centre, can sell Sindh government’s land. He was hearing the suo motu case pertaining to the lease and allotment of Sindh’s land at the Supreme Court’s Karachi registry on Tuesday. Justice Sajjad Ali Shah and Justice Munib Akhtar were the other two members of the bench. Justice Shah remarked that the Sindh High Court is also hearing numerous cases against the railway department. The court issued notices to the Sindh government and other respondents. According to the top judge, plots were distributed without auction. “One page says ‘No to Corruption’ on top while everyone commits corruption under that,” he said to the lawyer of a wind power project. The CJ remarked that each Pakistani bears a burden of Rs117,000 in debt. “Vested interests will continue but it’s our responsibility to ensure the protection of the state and its interests,” he said. Lawyers told the court that poultry farms are being shut down as they are not being granted lease extensions. The CJ said that whoever wants government land, they should participate in the auction. “We will not allow anyone to obtain land with auction,” he said. He reprimanded the revenue department’s secretary for unjust distribution of government land. The court ordered lawyers and Board of Revenue secretary to come prepared on the next hearing. The hearing was adjourned till Wednesday.